TPC Sawgrass-The Ultimate Golf Destination: For avid golfers, the experience is about so much more than 18 holes. The quality of the course can be the difference between a memorable game and a terrible outing. At TPC Sawgrass, you won’t need to worry about the latter option. TPC Sawgrass is one of the most famous golf courses in the world. It’s the home of the PGA Tour headquarters and hosts one of golf’s defining annual events, The Players Championship. It was built in 1980 with only the intention of hosting tournaments. Since then it has evolved into a must-see destination for those visiting Florida’s First Coast. Located in Ponte Vedra Beach, less than an hour from the historic city of St. Augustine, the course is one of the most challenging you’ll face. Golf fans know it for the “Island Green”, the signature 17th hole. If you’ve watched The Players Championship, it’s the hole on that tiny strip of land smack dab in the center of a pond. It’s responsible for a lot of balls in the water and dozens of frustrated pros. When you visit TPC Sawgrass, you’ll have the opportunity to join those pros and take your shot at the Island Green. The course offers four different membership options. The Charter Membership grants you access to TPC’s two courses (Dye’s Valley and Stadium) plus an additional 100 courses throughout the country. The Social Associate and Social Club memberships help you craft a fuller experience that includes dining at the TPC’s famed social club. If you’re intimidated by the thought of taking on a course that stumps even the most experienced pros, take lessons instead. The PGA Tour’s Performance Center offers an extensive curriculum so you can book a tee time with confidence. Better yet, TPC Sawgrass isn’t just about putting your golf skills to the ultimate test. Organize events for work groups and your entire family. Book a meeting or event at the Clubhouse. You can even book a wedding in one of the banquet halls. TPC Sawgrass is a multifaceted course that offers the best in golfing, dining, and event space. If you’re looking for a way to turn your dream golf trip into a vacation, this course should be at the top of your list. When you visit a course like TPC Sawgrass, it’s important to bring your best golf style. 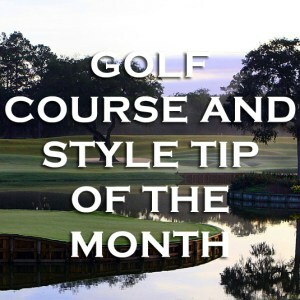 A saddle shoe is the ideal footwear choice for the golfer who cares about both tradition and good looks. The mini-grid red rubber outsole and contrast leather saddles look great during the day or for an evening. When you’re off the course, a well-made saddle adds a classic flair to any look. Look to our David Oxford or Denver Bison Saddle Shoes for strong options that help you maintain the balance between athletic functionality and traditional, masculine style. We offer a curated selection that suits your best golf ensembles. No one makes great quality saddle shoes like TB Phelps.